The driving force behind the company is the passion, hard work and expertise of Cape Town born and bred Carol Mills. It is through her efforts that the liqueurs have remained artisan, local and natural. The liqueurs have been carefully hand crafted with passion, attention to wholesome naturalness and packaged so as toÂ provide a sense of extraordinary occasion. There are NO ARTIFICIAL ADDITIVES or PRESERVATIVES in our liqueurs. Kaapse Liqueurs is a proudly South African company distributing liqueurs manufactured from locally sourced produce. All the ingredients are 100% South African, natural and indigenous to the area. Kaapse LiqueursÂ has made rapid progress as a company, with the range expanding significantly since the initial sales of Limoncello in 2013 by Carol Mills. Based in the Western Cape, the business has been built on the very popular “market industry” which has taken off in the area. The casual nature of this phenomenon has allowed for extensive interaction with customers and generated very positive reaction and feedback. Traditional liqueurs like Kaapse Liqueurs can enhance lifestyles, forming part of the celebration of relationships, get-togethers and festive community eating. Food pairings are a passion of the brand’s and the sensory experiences which can be created with the liqueurs are endless. These artisan liqueurs have been carefully hand-crafted, with attention to wholesome natural processes and ingredients, and then packaged toÂ provide a sense of extraordinary occasion. No artificial additives, colourants or preservatives are added to the liqueurs. Always proudly South African, the company aims to provide customers with an indulgent, delicious and 100% local experience. 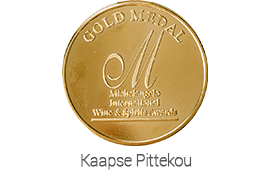 Kaapse Liqueurs was humbly honoured by the opportunity to participate in the 2016 Michelangelo International Wine and Spirit Show. Only three liqueurs were entered, all of which were Gold Medal winners! 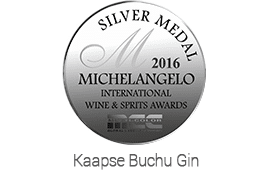 The Kaapse Liqueurs Buchu Gin won a Silver Medal. These coins were used for bottle deposit payments from around 1907 and were withdrawn from use in the early 1930’s. Carol Knolles Mills (nee Green) is the daughter of E.K.Green the 6th. He in turn was a direct descendent of the first E.K.Green, the founder of the E.K Green Castle Wine and Brandy Company. This once-thriving local business dates back to 1814. A South African producer, wholesaler and retailer, the E.K Green Castle Wine and Brandy Company spanned a number of generations. It was awarded 54 gold and silver medals at the Paris exhibition of 1867. Similarly successful exhibitions took place all over the world, such as Chicago (1893) and Philadelphia (1876), where more medals were received. E.K Green merged with Van Ryn Wine & Spirits and Henry C Collison to form SA Distilleries in 1902. In 1970, Oude Meester Cellars and South African Distilleries performed another merger, creating what is now known as Distell. Castle Wine and E.K Green Limited are now subsidiaries of the Distell Group. Whether motivated by this impressive family heritage or simply fulfilling her personal ambition, Carol passionately pursues her liqueur business and continually strives for South African quality and excellence.